In Content Station, managing and publishing content that is going to be viewed on digital devices such as tablets and smart phones by using the Adobe Content Viewer is done through the use of Dossiers and the use of the Digital Publishing application. Information about how to do this can be found in the Digital Publishing Tools User Guide. Currently, this User Guide is in PDF format only. 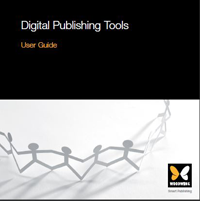 Figure: The cover of the Digital Publishing Tools User Guide in PDF format. Current version: 3.0.0, 10 March 2014.